Very nice didgeridoo tuned in C#. Very low and deep vibrating sound. Incredible look. 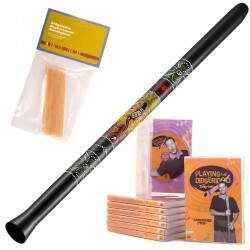 Looks and sounds like a real Australian didgeridoo, sometimes even better. The avantage of this didgeridoo is that its superstrong, lightweight so it's easy to carry and never have the stress that you brake your didge. The mouthpiecesize is great and if you want you can use beeswax on it. Blow on this didge, feel the vibrations and get a free facemassage! Re-waxing the mouthpiece on your didgeridoo has never been simpler. This kit includes 3 beeswax mouthpiece sticks. It also includes application instructions to show you step-by-step how to apply. You will have your new mouthpiece on in no time! Click on the Download Button how to replace your beeswax mouthpiece!